View of the administration building of the Osawatomie State Hospital in Osawatomie in Miami County, Kansas. 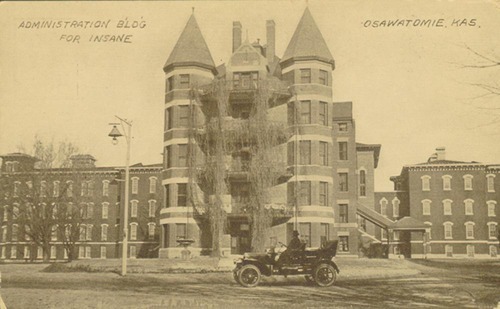 Established in 1866 as the Kansas Insane Asylum and renamed the Osawatomie State Hospital in 1901, it is the oldest state psychiatric hospital in Kansas. Also visible are a streetlight and a man seated in an open automobile.